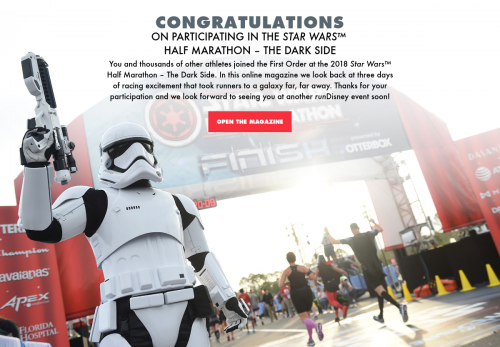 You and thousands of other athletes joined the First Order at the 2018 Star Wars™ Half Marathon – The Dark Side. In this online magazine we look back at three days of racing excitement that took runners to a galaxy far, far away. Thanks for your participation and we look forward to seeing you at another runDisney event soon! You and thousands of other athletes joined the First Order at the 2018 Star Wars™ Half Marathon — The Dark Side. In this online magazine we look back at three days of racing excitement that took runners to a galaxy far, far away. Thanks for your participation and we look forward to seeing you at another runDisney event soon!